Goats in Vilanculos, Mozambique (photo credit: ILRI/Ranjitha Puskur). 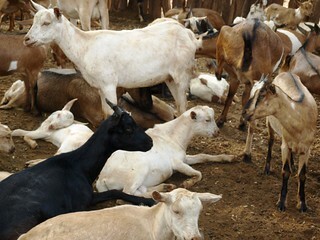 On 10 May 2012, the imGoats Inhassoro innovation platform held its fifth meeting at Vuca Interior, Mozambique. About 40 participants took part in the meeting, representing producers, community leaders, paraveterinarians, extension officers, researchers, and meat buyers and sellers. The meeting covered a range of topics, starting with a presentation of the baseline results and related (project) actions. Thereafter, each community gave an update on activities in the past two months about the communal grazing area and construction of improved kraals. What are the benefits of the innovation platform to date? What would be the challenges to maintain the innovation platform without project support? How could these challenges be overcome? Each stakeholder group presented their answers. Many participants identified ‘transport’ as one of the main challenges (as CARE still provides transport due to long distances between the communities but this would not be sustainable in the long term). The participants therefore decided that participants would organize their own transport to the next innovation platform meeting.